You have all heard of the Ice Age. Not the movie, the time period. The Ice age was an age of global cold. What caused all this? My belief (which is the same as other creationists) is that when God released the flood with all the volcanoes and such, the water that came up from the ground was very warm from being so close to the mantle, and so the oceans afterward were very warm, and released a lot of steam. This steam covered the earth, and it cooled from being so high, so it was very much snowing. 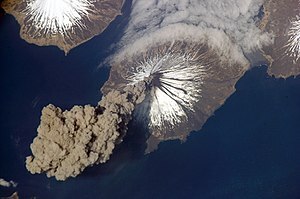 Also, when the volcanoes went boom, they released a lot of ash into the air, which much of the time blocked out the sun, cooling down the earth. This entry was posted in Uncategorized on June 27, 2012 by Captain Belaq. The earth is made up of five layers: The crust, upper mantle, mantle, outer core, and inner core. These layers are determined by several different methods, such as using seismic waves that are sent into the earth and bounce back in a certain way according to the density or composition of the layer they bounce off of, people can measure the gravity in the earth, and experiment simulating pressure and heat in the Earth. The crust: This is the thinnest layer, and yet the outermost layer, upon which we stand. This layer is composed mostly of silicates, typically quartz.. It has many mountains and low places, which is a good thing because if we did not have those and the Earth was totally flat, it would covered by water. The Mantle: Still composed mostly of silicates, this layer is very rich in Iron and magnesium. The mantle is divided into two parts: the upper mantle and the mantle. The upper mantle is molten lava and is under very low pressure (in comparison to the other layers, of course: assuming you could survive the heat, you would still be crushed from all sides by the pressure) so the upper layer moves around a lot more and more fluid than the mantle, which is very thick from all the pressure. The undivided upper and lower mantle together are the thickest layer in the earth. 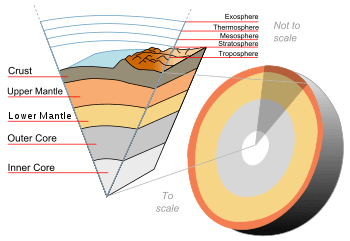 The Outer Core: As you go farther into the earth, the temperature increases, and so this layer is the most definite to kill you, though all the layers but the crust would melt you, or crush you, or both. Also, the denser substances sink, so the farther you go in, more of the denser elements are there also, so the outer core is comprised mostly of Iron and some Nickel, along with a few trace elements. The Inner Core. Also known as the center of the Earth, this is no longer a layer but a ball now. The pressure is so enormous that it is not even liquid. This is comprised, like the outer core, of nickel and iron. Compared to the center of the Earth, Atlas’ job is like holding up a feather! Even though the crust is only a fourth of the mantle, we have not been able to drill beyond it, thank goodness. It is just amazing the enormity of God’s creation. This entry was posted in Uncategorized on June 26, 2012 by Captain Belaq. There is always an ongoing debate between Evolutionists and Creationists, and the Grand Canyon is good evidence of creation. Evolutionists believe that the Grand Canyon was created by the slow erosion from streams and rivers over Billions of years, resulting in the huge canyon. 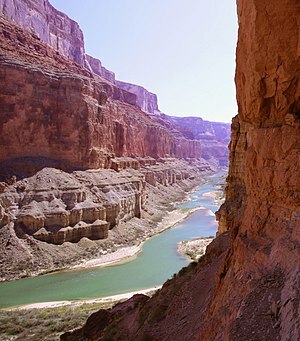 Creationists, however, know that the Canyon was created very quickly by the impeding or receding flood of Noah’s time. 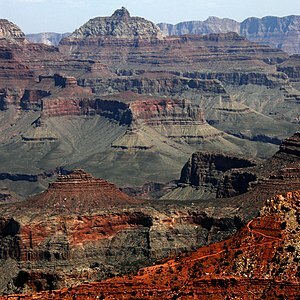 In the walls of the Grand Canyon, there is an area where to different types of rock meet. It is agreed that both types were deposited there by water, but according to the Evolutionists, the two top layer was deposited a half a billion years after the bottom layer! If this was true, there would be a sign of weathering over the bottom layer before the top layer came on. A flood though, would be able to deposit the layers one after another very quickly. The Evolutionists thought that there was no way such a large canyon could be made in such a short time. Until Mt. St. Helens blew. The lava flowed down and blocked the nearby river. Finally, the River burst through and in just ten days, a smaller version of the Grand Canyon was created. The Grand canyon is just so big. Truly, this is God’s creation. This entry was posted in Uncategorized on June 19, 2012 by Captain Belaq. e you ever, while looking through a bunch of polished stones, suddenly notice a streak of lightning flash over one, and then it was gone? Then, you try to find it again, and it is just nowhere to be found. While you are frantically trying to find it, do you wonder what creates that streak of light? Here, I will tell you the sources of lightning for Cats-eyes, Tiger-eyes, and star Sapphires, which are all essentially the same. Cats-eye: When you get a shiny piece of wire, and move it around, there is only one point where the light is reflected, and this point moves around as you move the wire. Let’s say you put it flat on a table. There is still a point where the light is reflected (let’s call it the point of reflection). Now, you put another piece of wire exactly next to it, and the point of reflection on that wire is right next to the first one! Now, put ten more pieces of wire along the first two, and you have line of light seeming to flash along the wires. In stone, much of their crystal makeup is fibrous, so the fibers do the same thing the wires do, only the fibers are much thinner, making a more uniform line of light. Tiger-eye: A long time ago, there was some Crocidolite (a blue, very fibrous stone) that became completely buried. As the inividual fibers broke down, they would be replaced by Silicon Dioxide, or Chalcedony. Because the fibers are randomly zig-zagged, there are many points of reflection, and so there are many streaks of lightning all over the stone. Star Sapphire: Ooookay, here is the complicated one. First, we have tiny Chrysoberyl crystal, twinned in several directions and very fibrous (photo below). Then we have the larger in diameter Sapphire, growing from underneath the Chrysoberyl. Over time, the Sapphire grows around the Chrysoberyl, then over on top, so the Chrysoberyl is now completely encased in Sapphire. Now, along come some miners who mine the Sapphire and sell it to a lapidary, who notices the Chrysoberyl fibers and cabs the Sapphire so that the Chrysoberyl is exactly in the center of the Cab. This is so that the light goes through the transparent Sapphire and reflects off the individual Chrysoberyl fibers, creating a Six-rayed star of light. When you walk past someone with a regular Sapphire, just a grey cab, or a brown stone, you don’t really notice, but when you walk past someone with a flash of lightning across their chest you are going to gasp. If you are going to a party, wear the brightest possible Cats-eye. You are sure to get heads turning. This entry was posted in Uncategorized on June 18, 2012 by Captain Belaq. In the years after the civil war, people began recuperating and advances in science were made, trade increased, and people took more interest in the beauty in gems. Soon the demand for gemstones was high, and scientists began to look for ways to create gemstones, especially Ruby. Alumina powder (three parts Oxygen to every two parts Aluminum) is kept in a container at the top of the machine (first photo). It falls down a tube with pure Oxygen. Next to it are tubes with pure Hydrogen being blown through. At the bottom the tubes open into a large cylinder. The Oxygen and Hydrogen combine and react with each other, creating a super hot arc. The Alumina, passing through the arc, melts and falls onto a platform. As more molten Alumina falls on top, it gradually creates an elongated ball, (called a boule) and the platform slowly descends, always keeping the top of the boule in the arc, giving it time to crystallize. At the beginning, coloring is added to the Alumina: Chromium for Ruby and Iron for Sapphire. When the process is done, the stone has the same deep beautiful color as natural Corundum. This entry was posted in Uncategorized on June 11, 2012 by Captain Belaq. Here is a poem I made for a poetry contest, enjoy! though “winter is better” is what I’ve been told. are magically transformed into gemstones. and I soon found out why. I tasted of the fruit and listened to the chirping of the canaries. tiny Quartz crystals in their make. as Tourmaline, (a stone fitting for a pretty little lass). there, peacefully dreaming, I lie. This entry was posted in Uncategorized on June 5, 2012 by Captain Belaq.